A little thing like parking should never get in the way of a big event. Reserve your parking spot for the big game or concert in El Segundo! Go online or download the ParkMobile app to reserve El Segundo stadium parking today! Get the app for iOS or Android. How Does ParkMobile Offer the Best El Segundo Stadium Parking? You already book plane reservations, hotel reservations, and restaurant reservations. Why not do the same thing with event parking in El Segundo? Now you can! We've solved the parking problems so many big stadiums face. With ParkMobile, you can easily make stadium parking reservations in El Segundo. 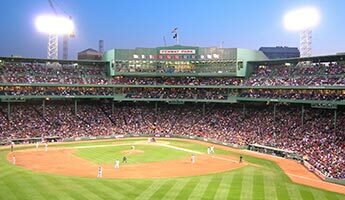 We're the preferred parking provider for many of the biggest entertainment and sports venues across the nation, which means we have the inside scoop on the most convenient stadium parking in the best areas. How do we do it? It's so simple. As we noted before, you can reserve and pay for parking before the big event online, all from the comfort of your home. Search for the arena or stadium name, select the occasion, pick your parking type, pay, and get ready to have some fun! You'll have a variety of event parking options at your fingertips, including private garages, parking lots, and private garages near the El Segundo stadium. Book right before you leave the house or make a reservation weeks ahead of time. It's your choice. ParkMobile always gives you parking options for life's biggest moments. Don't let a little thing like parking get in the way of a big game, concert, festival, or convention. With ParkMobile, event center parking doesn't require guessing. While other so called "fans" search for parking near the venue in El Segundo, or wait in a long kiosk line to pay, you can be on your feet or in your seat— cheering for your favorite team or dancing to your favorite song. The best fans are always there. They score big by reserving event parking ahead of time through ParkMobile! What about fans who need last-minute parking? They download the ParkMobile app to find and pay for parking near stadiums in El Segundo on-the-go. On top of parking lots and garages, the app lets you access car parks, street parking, covered parking, and more! Plus, book and pay through the ParkMobile app and you'll always know how much time you have left on your parking session. You'll get an alert before the session expires and can extend your session to help avoid a ticket. No coins, no meters, no payment kiosks, and no surprises. Just simplicity! Download the ParkMobile app and try pay by phone event parking in El Segundo today!